Surprised I can’t find this in the archives: How do you deal with a colleague (usually male) stealing your ideas, passing them off as his own in meetings with clients and/or repeating what you’ve said as though its his original idea? The phrase “I just said that” comes to mind, but it seems unprofessional to bicker in front of colleagues. What’s a gal to do? If he leaves your name off a project or acts like he did it all himself, again, talk to him privately to see if it was a mistake and to better understand what happened. I’d look at the course of the project, too, to assess how nefarious the colleague was — for example, if you were often CC:ed on emails with the boss about the project, or if they left off all but the highest ranking people from the project, I’d assume it was a mistake or just the way things are done at the company. After all, not everyone can go on the brief or get title credits (examples), and it even can be expensive to get the entire team together for meetings or even presentations, particularly if people bill by the hour. This guy is bad news. Were it an ’80s movie, he’d have a popped collar and be played by James Spader… or Sigourney Weaver. No amount of talking or light-hearted emails will remedy the situation, and my best advice would be to avoid this guy at all costs. If forced to work with him, keep a paper trail of anything you suggest. If he looms large in your work life, start looking for a new job ASAP — and if necessary look for outside projects that clearly show what your work product looks like in case he succeeds in keeping you from growing professionally at your own job. Think charity work, professional organizations, academic writing, freelancing, consulting, and more. Ladies, how do you respond when a coworker takes credit for your work? What have you seen work / not work in your office? Entry-level engineer here, at an extremely male-dominated company. This is something I struggle with nearly daily. I am young (less than a year out of college), and petite (which unfortunately makes me less intimating). In my time with the company, I have made a name for myself, and conversations with upper management, my performance review, and my recent raise/bonus indicate that I am valued by my department. However, another engineer on my team routinely does all of the above — repeats what I just said in a meeting, but says it louder as if it was his idea; leaves me out of email chains; most recently, he pretty much took over a large task I was working on, re-did everything I had already done, and got roughly the same results I had gotten in the first place (ignoring the 8 pages of data, and a detailed explanation I presented last week of everything I had tried so far). Yesterday I finally spoke out in a meeting, pointing out that I had collected two weeks worth of data and he was ignoring my results, and the room pretty much fell silent and then moved on with a different conversation. This is not the case for all male engineers I work with. Most of my department respects me and values my opinion. But there is a small handful of coworkers like the one above, who are the reason I go home frustrated at the end of the day. Tech employee here. That’s egregious and makes me mad. I’d be all over his boss to fix the behavior if I were your mentor. Some thoughts, possibly helpful, likely repeating what you already know: A recent Woman’s Day presenter suggested that you can address idea-thieves by saying things like “I’m so glad you support my idea, David,” or “I’m glad we’re on the same page, Apoorv” or “Thanks for backing me up, Lee” to politely draw attention back to the fact that you are, in fact, the person that shared an idea first. Regarding his other behavior… Does your manager know that this is happening? Can you present it in a factual way, such as: “I’ve noticed that John sometimes leaves me out of email chains where I would expect to be a key contributor. That’s affecting my ability to actively drive X project.” Sometimes a person is blind and just needs correction (sometimes from above); sometimes they are being corrected in ways you don’t see and will be gone soon if they don’t fix it; sometimes management doesn’t see what’s happening and needs you to point it out; and sometimes you just can’t change it (ugh). Don’t know if either of these help. I work in as an engineer in an extremely male dominated area (15 member team and I am the only female). My current team is fantastic and no one claims any one else’s credit. However, I was in a team where this routinely happened. When I joined that team, I started working on something which was not so important (it was a training exercise) but became very important within a few weeks with lot of attention paid by higher management. There was a male engineer in the team who never respected me and routinely dismissed me/my ideas in the meeting, suddenly became very interested in what I was working on. He inquired me about how that was going, what all I had done very casually and sent out a status report to every one who was involved and their managers. No mention of who did the work. Every one thanked him for all his efforts (which was none). I did have a chat with the manager about this. But that manager was so scared of this male engineer and wouldn’t say anything to him. He just dismissed me saying that it was minor. Then I started to keep my work to myself, started sending status immediately after the work was done so that everyone knew who did the work and giving vague answers to him about what I was doing which he didn’t like. Every meeting which involved him was a hell. With an imcompetant manager, he started bullying me. It became extremely toxic and I left the team to maintain my sanity and health. It is impossible to be not frustrated when you are working with these kinds of people. 1. However, you start sending the status and next steps to your manager every evening so that he constantly knows what you are working on. Don’t include the guy who is bothering you. 2. Don’t disclose your ideas to him. Keep them to yourself, execute them and share your results to your manager immediately. 3. At the same time, act nicely with him. If he proposes something, say “yeah..that’s a good idea..I will try that”. If he questions you why you did something your way, tell him that it came to your mind spontaneously and it would just take 30 mins to complete the experiment, so you did it.But you certainly do whatever he asked you to do. 4. Don’t answer his instant message or email as if it is your duty to respond to him immediately, especially if you are the middle of something which you want to complete your way. This will allow you to do whatever you were doing without him interfering or proposing new things. Answer him in a reasonable time, if it gets too late for you to answer him, just apologize (not a sincere one though, just to keep his ego fed) and tell him you were so busy that you didn’t get a chance to catch up on your email. 5. Build allies. This is a very long process. Your team members know him and probably hate him. Start meeting your team members during coffee break and establish trust with them. Don’t bring this guy up in the conversation, but say something got delayed or something that went wrong due to his interfernece and that comes up during your conversation, casually mention that you didn’t want to ignore him as he is so experienced and you value him, so things got delayed. That will open up people who don’t like him. At any cost, don’t badmouth any one, you never know who is with whom. But gradually, this will help you to know that guy’s weaknesses which may be useful for you. 6. If the situation just escalates and you are worried day and night about how to counter him, or guessing his next move and your managers don’t side with you, it is the time for you to get a new job. This obviously isn’t a suggestion of how to handle it — and I haven’t figured that out yet, and could use suggestions! Whoops, meant to make that a reply on my above post. I’m a frequent reader and seldom commenter, so I’m still figuring out how this comment section works! 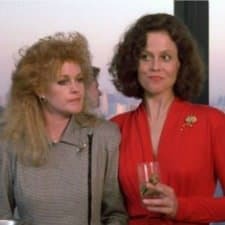 Just want to express my appreciation for the Working Girl reference picture. For example, I recently helped a colleague interpret a tricky specialized document. Colleague was working for a partner whose radar I’d like to be on, so I asked colleague if he would mind mentioning I helped, so partner knows I have skills in this particular area. Colleague kindly obliged and it felt nice to be recognized, but I’m guessing he wouldn’t have said anything if I hadn’t asked. Not to intentionally steal credit, but just because this wouldn’t have been the type of thing he’d think to mention otherwise. He’d just normally say “I think this document means X” and not provide a lot of detail as to how he got to that conclusion. So if you think you deserve credit, it doesn’t hurt to ask! When people steal my ideas or interrupt me in meetings, I usually make a point in the same meeting of saying “as I was saying and then repeat my idea. It helps reinforce the fact that just because a man said it louder, doesn’t mean it was his idea. I had this happen, except it was a manager who belittled me and took the credit for my work. Quite literally, he had no idea how I was doing a project (that he wanted, but the VP insisted on giving to me), belittled my efforts, rolled his eyes when I described how my new system was a vast improvement over what was done previously. He kept saying that I was screwing it up, condescended to me, etc., right up until my system was done in real time and rocked out loud. At that point, he jumped in and acted like it was all his idea, and that I had done merely administrative work on the systems and databases I invented. I ended up leaving that company a few months later. The sixty-hour weeks were one thing, but I was done working my tail off so someone else could steal the credit. I have noticed this happen at meetings where the woman states her idea in a way that detracts from the idea. She can do this by raising her voice at the end of her explanation, so that it sounds like a question instead of a statement. Or by using words that belittle her idea e.g. “I am not sure, this is just a suggestion, and I could be wrong, I am only thinking out loud here, but has anyone thought about perhaps doing [insert idea here]. Then a few minutes later the man restates the idea, but in a strong, positive way without any of the qualifications “we should do [insert idea here}. And this time everyone hears it. And I have also seen it happen where the idea thief is just a thief. Yes! Precursors and apologizing weakens comments and makes them seem “iffy”. Statements that sound like questions are treated as questions. A calm clear statement of an idea or proposal comes across so much stronger. +1. One time–ONE time–a male colleague (A) at my firm restated my idea. The biggest rainmaker in the room says, “Great point, A.” A jumped in and said, “Actually, that was Anons’ idea. I just wanted to make sure we followed up on it because it is the best approach we have come up with.” A actually had a reputation for being kind of a jerk, but I had mad respect for him not taking credit for my idea when he easily could have. More men need to do this when they notice an issue. I work for a big 4 public accounting firm in the South and more often than not it is passive aggressive females who are taking credit for my work with our mostly female partners. Due to the sort of chain of command that exists within public accounting (associate, senior associate, manager, senior manager), it can be very difficult to point out what work you did when a superior takes credit in front of a partner or client. Anyone else have a similar issue or advice? What would a man do if another may stole his idea or took credit for his idea? Good question, but it may not be relevant. If you read Linda Babcock’s research, you can see that women will often be socially punished for acting as assertive as a man. It isn’t fair, but it sometimes means that a woman may find it more effective to take a different approach than a man would. I have a question on this. I have a female colleague – she and I are the newest associates at the firm and I’ve noticed that she’s constantly keeping an eye out on what I do, what cases I’m working on and what clients I’m meeting with. This includes looking into my computer screen as she walks past (!) and looking at the sticky notes that I leave for myself on my desk (!) and asking me questions about that. I stopped leaving myself sticky notes on my desk for this exact reason and lock my screen every time I leave my desk. Lately, I was working on a motion that had nothing to do with her and she randomly jumped in and started texted the partner and told him that I needed some information. I have no idea where she came up with that. Wouldn’t I ask the partner myself if I was missing something important? I requested her to please contact him again and let him know that I didn’t need anything at the moment. Any tips on handling this messy situation?